Product prices and availability are accurate as of 2019-04-02 00:33:04 EDT and are subject to change. Any price and availability information displayed on http://www.amazon.com/ at the time of purchase will apply to the purchase of this product. 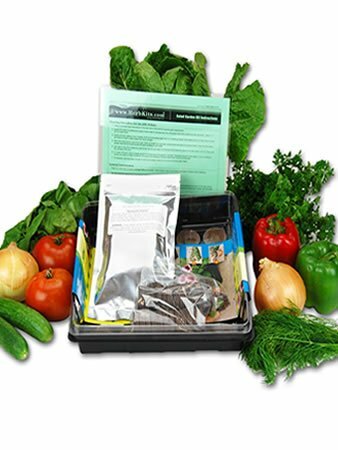 Grow your own Exotic Salad Garden with our indoor starter growing kit. 12 different seeds to start salad veggies! Argula, Mustard, Swiss Chard, Romaine, Chives, Parsley, Dill, Hamson Tomato, Utah Sweet Spanish Onion & More. For a very fun and rewarding experience, grow your own exotic lettuce garden. Includes chard, mustard greens, tasty herbs to add to salads. You can't beat the taste of salad made with your own produce. Grow natural, powerful and delicious food in your own garden! Our kit is designed to help you start lettuce greens in your own kitchen with a neat little 12" x 12" x 5" greenhouse. This greenhouse provides the perfect climate for fast plant propagation and growth. Once you get your plants started you can transfer them to your garden. We have included twelve of the most popular varieties of seed for you to try. You will be growing your own salad in no time.